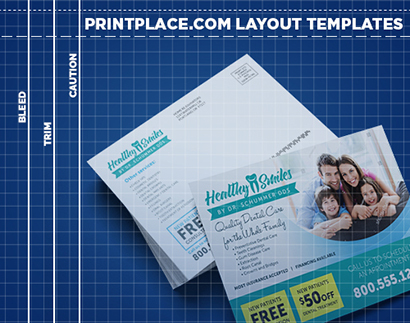 Use our postcard layout templates to make sure your postcards will be printed and trimmed at the exact place you intend. The trim line shows where your finished piece will be trimmed, but since paper can shift during trimming, this can vary slightly. Because of this, your artwork should extend 1/8? past the trim line, all the way to the bleed line. Download the format of your choice from the list below. 1. Pay attention to the safe area, cut and bleed area to make sure your postcard designs don't get cut out. 2. Be mindful of the space available in your card, emphasize on your special offer and call-to-action. 3. Indicia and address is located at the lower right portion at the back of the postcard. Indicia is used when mailing in bulk, as opposed to using stamps.